welcome, welcome, boys and girls, to installment number two of BESTbooks' December Sale-A-Thon (just like a car dealership, only three times more likely to survive the economic downturn). as i sit back with my theraputic pint of Ben & Jerry's, gather 'round the camp fire to appreciate MoonBindery's fine leather binding. 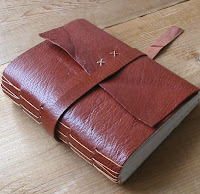 with her first book produced at age nine, the lifetime of experience shows in the terra cotta leather journal (or sketchbook, hardbound, 224 pages, medieval stitch binding, also made with those deckled edges everybody thinks are so cool these days) pictured above. since i've a paper on boring old modernist literature awaiting me, faithful readers, i'm afraid i can't stay and oogle with you, so i shall leave you to drool on the fancy leather (although probably, if you damaged it, you bought, so let's try and be careful about where we get our drool exactly, if we please could) and fawn over the cute little Xs (because keeping your closures attached in a stylish manner is what it's all about, thank you very much) while i try and reconcile the ugliness of james joyce's prose with the attractiveness of medieval style exposed bindings.